BHAKTAPUR, Sep 06: A tongue piercing festival was held in Madhyapur Thimi after a span of 11 years. Birendra Bhakta Gaju Shrestha,29, of ward no. 5 in the municipality resumed the festival by piercing his tongue. 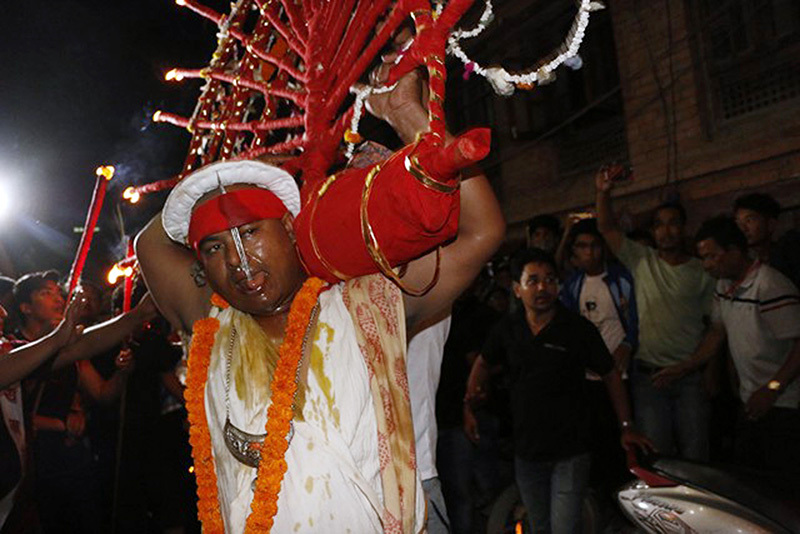 The festival is observed a day after the Indra Jatra festival. Local youths revived the festival locally called Yeya Punhiya Meya Pwan Khanegu. It had remained stalled since 11 years. The tongue piercing took place in front of the Digu Bhairav temple in Digu tole of Thimi. After piercing his tongue, Shrestha travelled around the locality by foot, which is traditionally believed to ward off evil spirits and demons. The tongue piercing festival is more famous in Bode, that also falls under the same municipality. It is observed on the 2nd of Baisakh in the lunar calendar every year.